I saw this on Pinterest and LOVE IT! But the link was no good. I would love to find the pattern. It looks pretty easy to figure out except I'm not sure if there is a tiny band of red along the edges of the gold in the box. See what I mean? Any help is appreciated. To me it looks like the one block is just pieced with striped fabric. Four quarter square triangles, matching the printed stripe in the fabric. The reason why some blocks look like there's a red border on that block is because some of the blocks were cut so that the gold stripe forms the square in the middle, and some were cut with the blue forming the center square. It's just how the print of the fabric wound up in the block. I think it is cut like a tube quilt..try missouri quilt co. Made with striped fabric....love it! From the looks of the binding the the stripped square is cut from one piece of stripped fabric. A square cut in half diagonally and then diagonlly again for quarter HST. it does look like a tube quilt, I can see triangle seams making up the squares. the petals look just like my left overs from cutting drunkard's path sections. I made a "petal" quilt with them . i'll post a pic if I can. Thats what I think also, it sure looks like the stripe in the binding fabric to me. Gorgeous quilt! 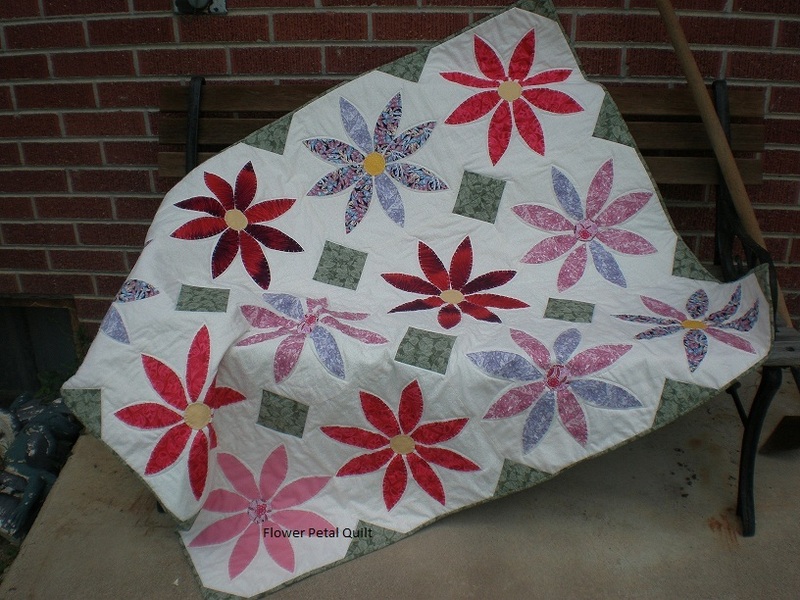 Love your petal quilt Did you appliuque the green squares ? I love the pattern too!!! All I know is .. it is beautiful. Nice crisp and clean looking. I think you are right...it is a striped fabric. Thanks for the suggestions. I don't know about a tube quilt, but I will go to Missouri Star and look at it. They are always a lot of help. Just like here. I had not caught that it was a striped fabric. Thank you. It is a very pretty quilt ~ have fun trying to make one for yourself! It looks like a red border to me next to the gold one. I agree the fabric does the work. Evelynquilts- no I didn't applique the green squares. I put sqs on the corners of the "petal" blocks and drew a line, stitched and folded back to make triangles. I had just enough of that green to finish too! Your quilt is darling I had to pin it Thanks! No, but I love it too! That is a pretty and happy quilt. Yes, it is made with striped fabric triangles. The other block is an hour glass with appliqued flower. I would like to try this one. Looks good. I've never thought to use striped fabric for that effect. Thanks! 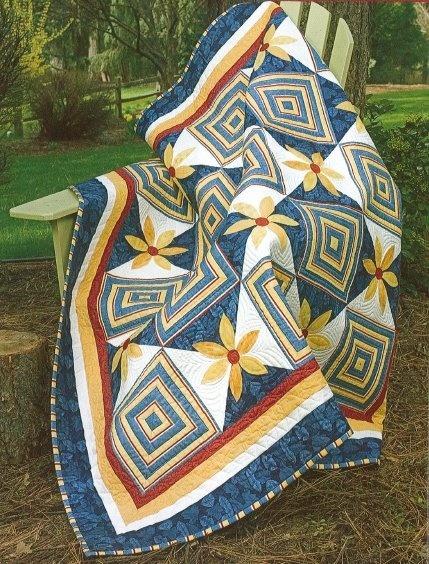 I love the colors in that quilt - and I agree that it is a striped fabric. I believe it is a Debbie Mumm pattern. I made it several years ago in purples. The stripe is fabric, not pieced. No but it sure is pretty. I can't help you with the pattern, but I hope you find it! It is such a beautiful quilt! It looks like it is the pattern in the bottom left of this book, only made with different fabrics and an applique flower.